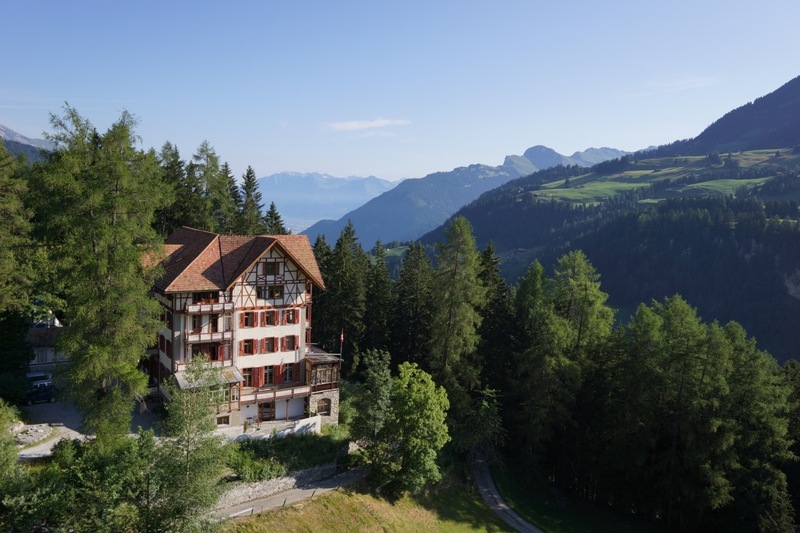 The Waldhotel Pradaschier can look back on an eventful history of more than 100 years. Built around 1900 as a health resort, it served during the Second World War as a military accommodation and as a children’s home, followed by a holiday camp. In the 1990s, it was first used as a transit centre for asylum seekers before it was reopened as a guesthouse. Since the gentle reconstruction in 2010, it has now housed the Ganden Chökhor course and meditation centre. However, since the holiday region Lenzerheide/Valbella has a need for cheap accommodation during the summer and sports holidays, the Waldhotel also offers a boarding house for external guests during this time. The Waldhotel Waldhotel, whose original building fabric from the Gründerzeit could be largely preserved, is simple but stylishly furnished and offers a total of 55 beds in rooms of 1,2,3,4 and 6 rooms. Toilets and showers are on the floor. On the ground floor there is the salon and the large dining room as well as the distinctive large glazed terraces, which can be used according to the weather and outside temperatures as intended by the builders of the forest hotel. In a dreamlike environment, you can escape the hectic pace of everyday life and let your mind rest. The romantic former forest hotel and centre of Ganden Chökhor (built in 1900) offers a unique ambience. With the reconstruction in 2010 we adapted the infrastructure of the former pension to the needs of a meditation centre. In the former cellar of the house, a modern meditation room in classical Tibetan style was built, which can be used for meditation courses and lectures. Otherwise, the rest of the hotel was left largely ‘culturally neutral’, so that it can be used by everyone without any problems.